On Monday 10 July a resident in Sliddery was at the kitchen window washing the dishes and keeping an eye on the garden birds, when this stunning bird with its pink body, pale orange legs and bill, and glossy black head, wings and tail appeared. 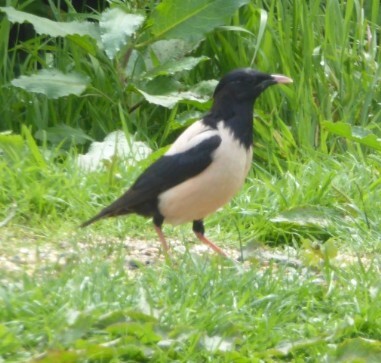 As an experienced bird-watcher, he knew instantly that it was a Rose-coloured Starling and called his brother. The excitement was palpable. The bird was associating with a flock of Common Starling and was feeding in the adjacent fields as well as coming into the garden. The bird was later photographed, caught and ringed by a licensed ringer. 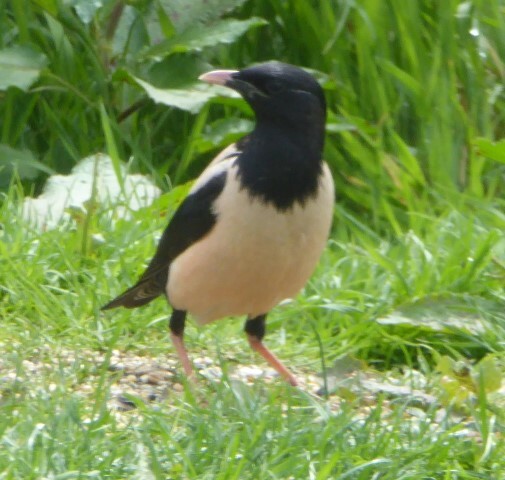 In the previous month there had been reports of Rose-coloured Starling from six locations in the UK, three in Scotland on Islay, Barra and Skye. It is not known how many birds were involved. 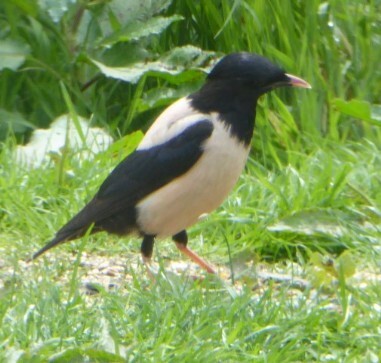 The Rose-coloured Starling is a rare vagrant to Arran. The last report had been in Brodick on 28 June 2002. Its breeding range is from easternmost Europe across temperate southern Asia. It is a strong migrant, and winters in India and tropical Asia. It is a bird of steppe and open agricultural land. In years when grasshoppers and other insects are abundant, it will erupt well beyond its core range, with occasionally significant numbers reaching western Europe and the UK. In their natural habitat they are highly gregarious birds, and often form large, noisy flocks, which can on occasion be a pest for growers of cereal crops or orchards. On the other hand they are also greatly beneficial to farmers as they prey on pests such as locusts and grasshoppers, thereby limiting their numbers. For example in Xinjiang province in China farmers build artificial nests to attract the birds and the birds help control locusts reducing the use of costly polluting insecticide. The birds breed in tight colonies in a very short breeding season timed to take advantage of peak abundance of grasshoppers during May to June. It is during dispersal after breeding that some birds stray into north-west Europe. The Sliddery bird was one such bird in 2017.